I learned to knit this past spring. I don't know that I'll ever learn to do anything intricate or complicated. I enjoy the simple patterns that I can put down and pick up without forgetting where I am. Patterns that are perfect for my crazy, sporadic often ADD days. I'm a simple kind of girl anyway. I began knitting a scarf a couple of months ago. I've messed up and had to take out and start completely over quite a few times. Sort of frustrating. But a few weeks ago as I started over yet again I realized how much my knitting mirrors my spiritual life. When I first begin a knitting project I can't picture what it will look like without the photo from the pattern. I cast on the stitches. Often my cast on stitches are too tight and I have to start over. Then I begin. 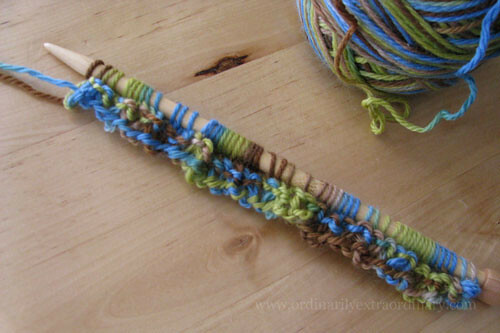 I knit or purl whichever the pattern calls for and well…it looks messy for the first bit. I can't for the life of me picture it in my head. Inevitably I make a mistake. Sometimes I'm able to slowly take out stitch by stitch until I find my mistake, but more often than not I end up unraveling the entire thing and beginning again. I'm not an experienced enough knitter to realize how I made the mistake. Eventually though the beauty of the pattern begins to emerge. I can see what it will become. How often does God patiently do the same with me? Taking out stitch by stitch and knitting once again. Yes, I'll make mistakes. Spiritually I may look messy. You may not see the master pattern. And there will be times I'll wonder how God continues to patiently knit my story together. But he will. And he will do the same for those who seek him. For those who trust Him. If we trust and seek He will patiently knit our story until a beautiful masterpiece begins to emerge.